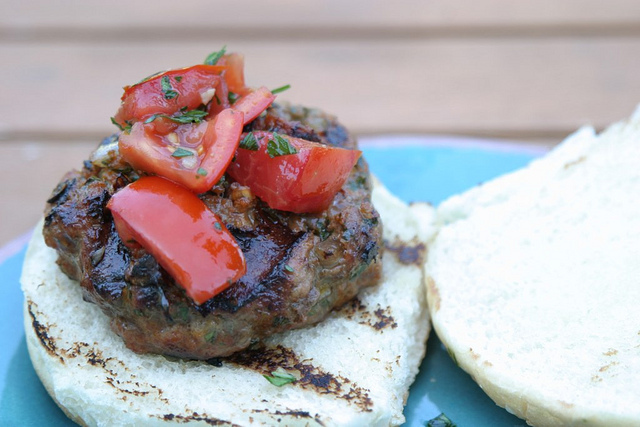 I found these Turkish Lamb Burgers in Delicious Magazine and I thought it would make an excellent Sunday grill. Heavy on exotic spices, it is a great way to familiarize with the delights of Turkish cooking. You can either stuff the patties into warm pita bread, roll the mixture into meatballs and serve with yogurt sauce on the side as a starter or you can just serve them on buns next to mixed salad or pickled green chillies. – mix all the ingredients together in a large bowl and season well. – shape into 8 even-size burgers, each about 3/4 in thick.